Officer Accardi allowed motorist and her two dogs to wait in his air conditioned police cruiser while the vehicle was repaired. Officer Accardi with Mini Golden Doodle Molly. Atlantic Beach, NY - July 3, 2018 - The Nassau County Police Department reports the details of a Disabled Motorist that occurred at 11:45am on Sunday, July 1, 2018 on the Atlantic Beach Bridge. According to Police, Police Officer Accardi received a radio call to assist a disabled motorist on the Atlantic Beach Bridge. He arrived on the scene to observe a BMW 530 on the side of the road with the female driver, Joan Silke, of Bayside, out of the vehicle with her two dogs on their leashes. For their safety he parked his Radio Motor Patrol Vehicle behind her vehicle with his emergency lights activated. 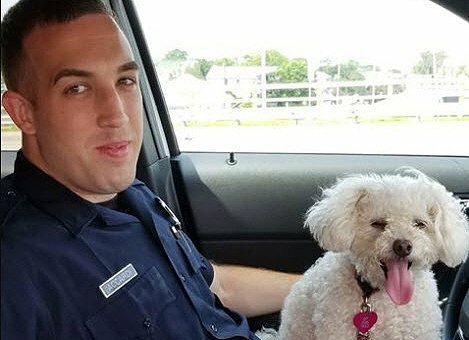 As Officer Accardi exited his vehicle and approached the trio, he observed that the two dogs were in distress from the extreme heat. He offered to Joan Silke and her two female twelve year old Mini Golden Doodle -2nd generation- dogs to get into his vehicle where the air conditioning could help to relieve the dog’s distress. The owner put the cream colored Molly and the apricot colored Maggie into the vehicle with Officer Accardi and they soon began to respond to the cooler temperature. Within the hour the owner’s vehicle was operational and the trio were on their way home. Subject: LongIsland.com - Your Name sent you Article details of "Nassau Police Officer Assists Disabled Motorist and Dogs Suffering from Heat Distress"